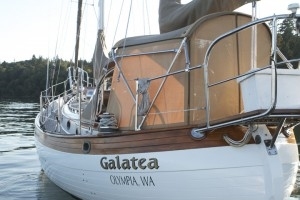 Sunbrella® View is a perforated version of Sunbrella marine fabric featured prominently in the makeover of the Galatea, a Hans Christian blue-water cruising boat moored in Olympia, Wash. As part of a comprehensive marine canvas makeover, fabricator Jason Iverson demonstrated how Sunbrella View can be used to create an on-deck enclosure that gives the boat’s owners, Teri and Steve Mason, protection from the elements plus privacy and an unobstructed view. The Masons, who value the open feeling of being on the water, were concerned that an enclosure would make the deck feel confined. By incorporating Sunbrella View Toast into the enclosure, Iverson was able to assure that the deck retains 360-degree views while allowing the Masons and their guests to enjoy comfort and privacy. Marine uses for View, which is available in 60-inch widths and 14 colors, are not limited to on-deck enclosures. 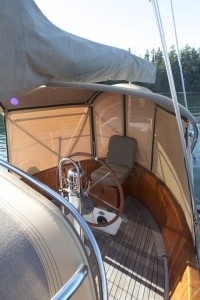 Below deck, View can provide sun protection at windows and portholes without blocking too much light. Snap-on shades made from Sunbrella View filter 95 percent of the heat from the sun, keeping the cabin cooler yet well lit.